The European Human Rights Advocacy Centre (EHRAC), based at Middlesex University, has joined forces with the Allard K Lowenstein International Human Rights Clinic at Yale Law School in New Haven, Connecticut, USA. 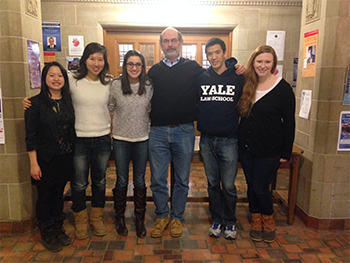 Five students from Yale will be researching events in eastern Ukraine under the supervision of Professor James Silk (pictured with his students) to assist EHRAC with its pending casework at the European Court of Human Rights (ECtHR). Commenting on the involvement of Yale, EHRAC Director Professor Philip Leach said: "We are grateful for their contribution to EHRAC's work and hope that this will be a long-standing relationship between the Yale Clinic and EHRAC." Professor Silk, who is Clinical Professor of Law and Supervising Attorney at Yale Law School, added: "I've been eager to have our students work with EHRAC since I met Professor Leach a year ago and was deeply impressed by the work that he and his colleagues are doing. "This is a wonderful opportunity for the students in the Human Rights Clinic at Yale. By collaborating with EHRAC on its important efforts to secure justice at the European Court of Human Rights for people who have suffered serious abuses, they are having an extraordinary learning experience." Since EHRAC was founded in 2003, more than 100 judgments have been passed down from the ECtHR in cases brought by the Centre. Of those, 96 per cent established violations of the European Convention on Human Rights. Read more about EHRAC's work.